Featuring wheat branches and leaves in the heading, this flat printed wedding program combines typographic design with a bit of rustic charm. Here are the fonts that have been used in the wedding program above. Like this wedding program? You can personalize it with your own wording and details at minted. 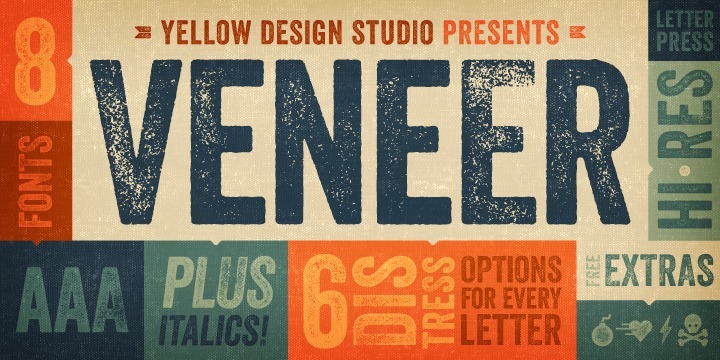 Veneer is a high resolution hand-crafted letterpress font that’s vintage and authentic with a touch of grunge. The Veneer family includes Veneer, Veneer Two, and Veneer Three with Veneer containing the least distressed characters and Veneer Three the most. Mix and match as desired to create realistic letterpress type.